Among online sportsbooks, 32Red Sport definitely seems to offer quite much. Being an addition to the 32Red Casino gives the sportbook instant credibility based on the sterling reputation for great gameplay. Being powered by Microgaming and being listed on the London Stock Exchange affirms 32Red Sport’s legitimacy even further. An impressive array of sports is available for betting on 32Red Sport. These include football, horse racing, dog racing, tennis, golf, cricket, rugby union, rugby league, American football, baseball, basketball, boxing, chess, cycling, darts, floorboard, handball, ice hockey, motorsports, politics, surfing, table tennis, trotting, mixed martial arts, volleyball and more. Next to each listed sport on the main page, 32Red Sport lists the number of betting opportunities. If betting on football is your specialty, then 32Red Sport will be of special interest. Players can wager on ICC World Cup matches as well as tournament bets. Of course players can also wage on Premier league, the Championship league, League One, League Two, Primera Division as well as the Six Nations Championship. 32Red Sport also gives the opportunity to wage on any top European football matches. 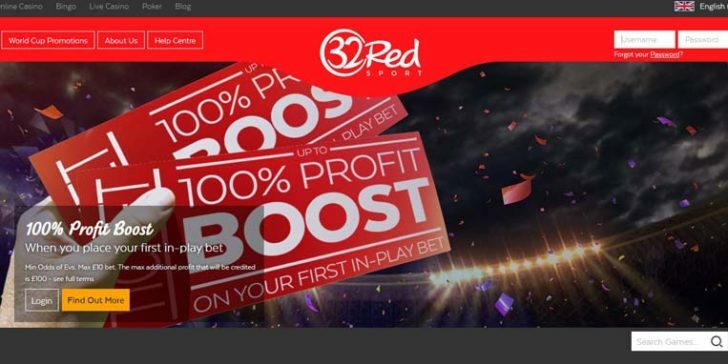 However, if you’re more of an RPG fanatic and enjoy betting on E-sports, 32Red Sportsbook is still the right place for you! Legue of Legends is the only available game for E-sports betting, however you will surely find more options in the near future at the constantly developing website! Players can make wagers on 32Red Sport that start as low as EUR 0.50. All odds that are available are shown in decimal or fractional form. Often the odds offered for correct score wagers, soccer over/under and horseracing are far better for other sites. 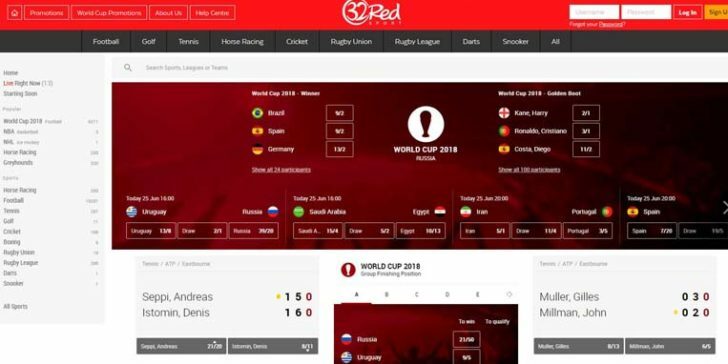 Live betting and mobile support is also offered on 32Red Sport. Withdrawing money is relatively simple with 32Red Sport. Players are required to withdraw at least EUR 10 per transaction. Withdrawals can be made via debit cards, Paypal, credit cards, Skrill, Neteller, Ecocard, Click2Pay, Entropay, PaySafeCard, Ukash and direct wire transfer. The customer support at 32Red Sport is open 24 hours a day, seven days a week. They can be reached through email, instant chat, telephone, mail and Skype. For a sportsbook that offers a good platform with incredible betting options, Red32 Sport is highly recommended. Don’t Lose Your Money on Sports Betting Ever Again! Play! Find the Best Horse Racing Betting Odds in the UK with 32Red Sportsbook! Play! Earn a 100% Profit Boost on Sports Betting With 32Red Sports! Play! Win GBP 1,000 at 32Red Sportsbook by Wagering on Wimbledon Events Play! Participate in 32Red Sportsbook’s Wimbledon GBP 2k Semi Final for Great Rewards Play! Enjoy 32Red Sport`s Enhanced Offer Play! Don’t Lose Your Money on Sports Betting Ever Again!